The Back to Basics (B2B) Cyclocross Series is a Wednesday night series in Golden, Colorado, that is supported by local cycling companies, wellness businesses, bike shops and racing teams. The outpouring of volunteer support means that the racing is affordable. The entry fee is a low $15 for pre-registered athletes and $20 on site. Juniors are just $5. B2B is a success story for Colorado cyclocross, an indicator of the sport’s health in the States, and an important piece in the developmental puzzle for ’cross athletes of all ages. So just how did all this great stuff happen? 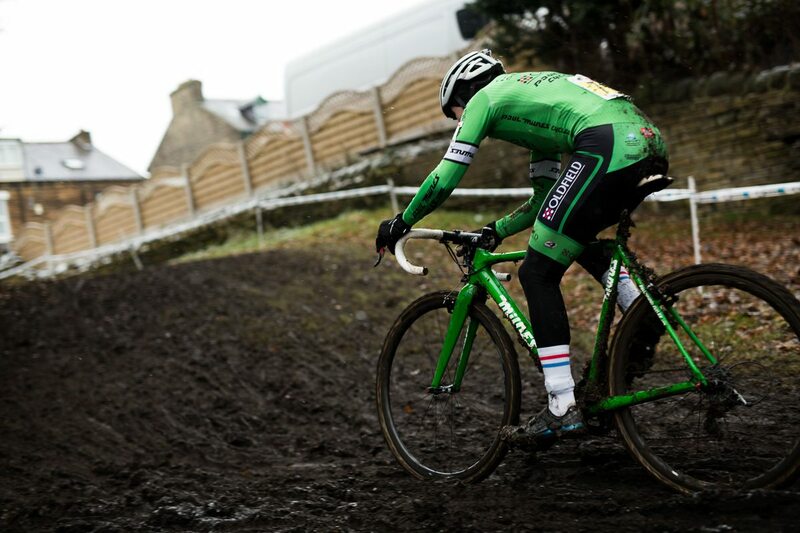 One of the most important elements of a cyclocross race is a dependable venue that is resistant to damage, no matter how bad the conditions. The story of the B2B racing venue is a tale of vision, determination, patience and cooperation among landowners, racers, teams, city staff, and dedicated companies in the bicycle industry. The Back to Basics racecourse is located on land owned by the State of Colorado and operated by the Lookout Mountain Youth Services Center, a youth correctional facility. The land is bordered on two sides by a golf course owned by the city of Golden, and features pebbly soil, waist-high prairie grass, cattails in the low areas, and prickly pear cactus. At the center of the venue is an old grass-covered soccer field. In 2006, Golden-area ’cross visionary Lee Waldman saw the property’s potential and contacted the director of the correctional facility, who agreed to allow Lee to develop the property for cyclocross and short track mountain bike riding. In return for use of the land, Lee annually donates money to the Center to use as they see fit. This relationship continues today, and in addition to racing, the venue is open year-round for ’cross and mountain bike use. The development of the venue for cyclocross was accomplished through the volunteer labor of many dedicated individuals, ’cross teams, local cycling companies, and staff from the city of Golden Parks and Recreation Department. The initial work was accomplished by Lee over the course of three summers. “I burned out five or six lawn mowers in the first couple of years,” said a laughing Lee. “The grass is so tough.” Lee’s labor of love carved a series of mown loops at the venue. In the first years, the course, which was known for being narrow and bumpy, was largely used for informal training sessions by Lee and his teammates. With the support of local bike shops Red Rocky Cyclery and Green Mountain Sports, the course was also used for one weekend race each year. In 2012, John Shearer, a bicycle industry veteran and rep for White Lightning, was brought in as assistant race director. A staircase and sand pit were built with donated materials and hours of volunteer work. By 2013, B2B was a fixture on the Colorado racing calendar. Lee moved to the Feedback Sports Racing Team, and the venue took another significant step forward. The company rented mini-bulldozers and sent its staff to work on the course. “We are lucky to live in such a great place for cycling, and it is important for our company and staff to support the local race scene,” said Doug Hudson, owner of Feedback Sports. The venue now has multiple challenging elements and several course options, all of which are three meters wide and offer safe passing. With the inclusion of the Feedback Cup on Halloween weekend, the venue supported an incredible 2,000 racer days in 2015. Back to Basics exemplifies the best of Colorado cyclocross and the world ’cross community. The first thing you notice about the races is the great attitude. The events are supportive, fun, respectful, loud, and positive. There is plenty of good-natured heckling and tons of high fives. Colorado has a high level of racing, and has earned the reputation for having many athletes who can be characterized as having a certain ‘high intensity’. This sort of type-A behavior, however, is minimized at Back to Basics. “The series is about getting in shape, getting better, and getting more people on bikes,” said Lee. B2B is ostensibly a series of training races, which helps maintain the low-key atmosphere. For the beginner adults, three of the races feature skills clinics conducted by Inspired Training, a local family-owned and operated coaching company. One key to the success of the series is vertical age integration. The American model of cyclocross, in which ’cross is a participatory sport and not just for elites and spectators, thrives when a race achieves maximum integration across athletes of all ages. Each week in 2015, B2B hosted athletes aged from 8 to 68. In the hour before the racing, the Golden Junior Bike Experience (GBX) brought kids aged 8–11 for coaching sessions. The adult racing then followed, with middle school and high school kids mixing it up with seniors and masters. What happened next was heart-warming and perfect: the middle school racers who had just finished were tasked with watching young toddlers so that moms and dads could have their turn at the racing. As more ’cross athletes have children, it is critical that events provide a positive experience for entire families. B2B has embraced vertical age integration, and thereby eliminated a major barrier to participation for athletes with families. The involvement of the cycling industry at this little midweek series is particularly astounding. The series is named after a local massage and wellness company named ‘Back to Basics’, which just happens to perfectly fit the attitude of the series. Other major presences at the 2015 races were Primal Wear, Feedback Sports, Spot Brand Bicycles, White Lightning, Inspired Training, and a local legal firm named The Cyclist-Lawyer.com. On two race nights, Primal staff set up a table for a formal dinner, complete with fine silver, on the side of the race course. Four bicycle shops set up tents each week to provide mechanical, liquid and bacon support. There are many incredible people at Back to Basics who share their expertise and love of the sport with the next generation of riders. “Our ’cross culture is very passionate, and very committed to growing the sport through supporting new riders,” said Clint Bickmore, former President of the Bicycle Racing Association of Colorado. “The Back to Basics series exemplifies and brings out the best in our cycling community.” Clint’s words perfectly sum up the attitude of some of Colorado’s leading riders who participate at B2B. Melissa Barker, who won her age group at the 2016 National Championships in Asheville, is a teacher and coach at a school near Boulder. 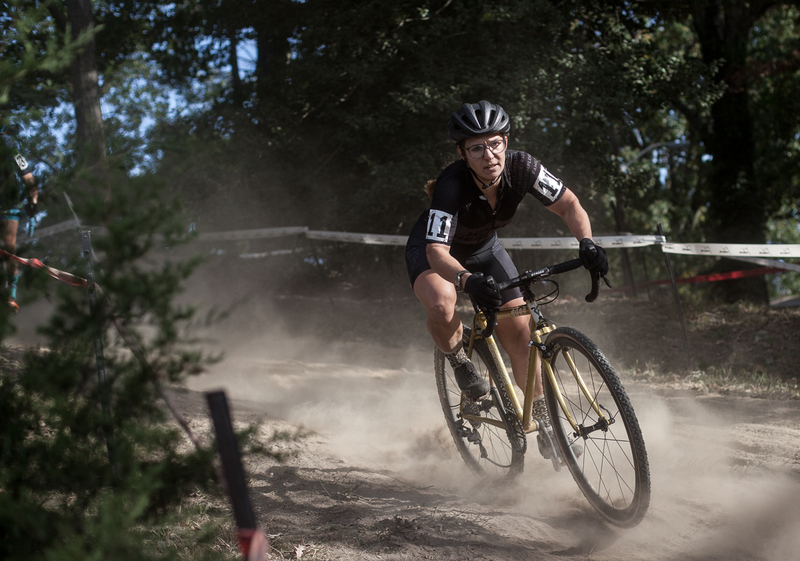 Each week last fall, she brought 20 high school racers to compete in Golden. Former singlespeed national champion (and Feedback employee) Tim Allen coaches with the GBX junior program. Inspired Training, which conducts the skills clinics for beginners, is one big family: Mom Sue is a multiple-time US masters champ on the road, husband Scott works for the advocacy group Bicycle Colorado, son Drew is a pro roadie and singlespeed ’cross stud, and son Christopher is a top tier racer and moto official. Another luminary is Jesse Swift, one of the fastest guys in Colorado. When he’s not hopping over the barriers, he is a science teacher at the nearby Golden Middle School and runs the school’s mountain bike club, which often draws 45 kids on weekly rides. 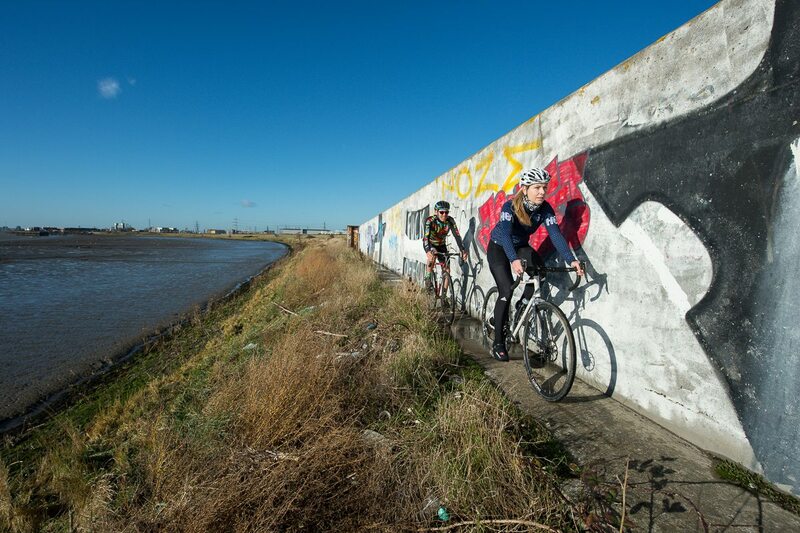 And you guessed it, some of those rides take place at the B2B ’cross course. Local cycling attorney and former pro roadie Megan Hottman is committed to introducing women to competitive riding. She spearheaded the effort to include a Newbie Women class at B2B in 2015, which introduced nearly 20 women to the sport in just one season. With the commitment demonstrated by these cycling role models, it is no wonder ’cross has grown tenfold in the States in the last decade. While not every area has a passionate base of ’cross fanatics as large as Golden’s, it is possible to develop a successful series in your community. Here’s the recipe: Start with one ’cross visionary who is committed to the sport. Add cooperation and partnerships with land managers, clubs and teams, cycling retailers, local cycling luminaries, and other interested stakeholders. Build a reliable team of course builders, registrars, volunteers, and officials. Find a good day on the calendar that allows maximum participation. Make the events approachable and fun for beginners, and build your events with an eye towards vertical age integration so that entire families can enjoy the racing. Keep the entry fee low to eliminate the most obvious barrier to entry. Focus on fun, safety, and the racer experience. Then give your event some time to cook and mature. Your ’cross village will not be built in one day, but with the right elements in place your ’cross community can thrive with the creation of a successful, low-key weekly series.